The whole complicated and weird Jason Kidd situation has taken another turn. 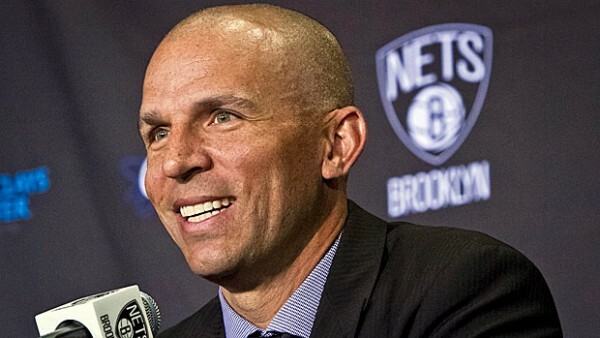 The Brooklyn Nets aren’t going to keep him in any position, but they won’t fire him either. The Milwaukee Bucks just want him as a head coach (or so they say), and aren’t offering more than a second round draft pick. Right now the deal is stuck on the quality of the draft pick: The Brooklyn Nets, filled with bad contracts and no draft picks in high places, want a first rounder. The Milwaukee Bucks, who according to the sources aren’t interested in making Kidd anything more than a head coach: No general manager, no team president or any front office job, aren’t willing to give more than a second round pick for him. It’s hard to say if Kidd actually wanted to jump over the head of Billy King and become the team’s deciding person or was it just a ploy to get the Nets to fire him. It’s hard to say with Kidd, who has gotten head coaches fired as a player and has had some dubious moments as a person behind the scenes. It seems like the trend of point guards hitting the bench to become head coaches out of retirement without any assistant experience: Mark Jackson, Derek Fisher and Kidd himself, have something else in common: They’re not very likable. Whatever Kidd was planning, it seems to have worked. At first this was supposed to be a negotiation between owners, but it turned out to become uglier and more complicated once the story was leaked. The negotiations are now being handled by John Hammond, the Bucks’ GM and Billy King, occupying the same position for the Nets. What about Larry Drew? Well, the Bucks owners haven’t been talking to him at all since the whole Jason Kidd thing broke out. Why should they? They wanted to fire him anyway, and they don’t mind the public humiliation involved. Do they care that this is a perfect example of bad ownership which might send a warning sign to fans about the direction this franchise is taking in its attempts to rebuild? No. They only care that Jason Kidd was able to do reasonably well with a bunch of egos and navigate them into the playoffs. So what if he didn’t get along with his assistants and isn’t exactly a moral person? So what if it’s not quite certain that it has been his coaching that helped the Nets bounced back from a 10-21 start to the season? He is good friends with the owner, and while intended to be a head coach now, that can quickly be changed in one year after giving up a second round draft pick for him.